In September, I attended the 34th Western Reserve Writers Conference and Workshop, driving up from NC, eager to hear the keynote speaker, Brian Klems, online editor of Writer’s Digest. The conference was fantastic, and starting in 2016, the Cuyahoga Library sponsors it to support writers. The South Euclid-Lyndhurst branch hosting the conference has a Writer Center that makes me want to live in Cleveland. In between sessions, I chanced upon Brian and we chatted for a few minutes. He’s a super nice guy, of course, being from the Midwest, like myself. We Midwesterners are so friendly. Brian agreed to a written interview for my blog, and I promised to share links to his work and his book. He’s a pretty funny guy and in his keynote speech, he shared a few stories from his parenting book. If you’re a parent, or even if you’re not and love kids, I recommend it. Many writers have an unusual and varied employment history. Mine includes framing / remodeling, llama husbandry, job coaching, home health care, and substitute teaching. I’ve also been a barista, a wine steward, and a personal assistant. Brian’s career climb is more logical, with surprising summers. “During sophomore year of high school, I landed my first job bagging groceries at a local supermarket. One close friend also worked there, so we’d align our shifts to get off at the same time and hang out together after. I spent most of that money at a local Perkins and on CDs. Next, I was selected to take part in the inaugural ArtWorks Apprentice program for young writers in Cincinnati. I not only learned how to refine my writing, but also a bit of photography and film development (which I completely forget now, so thank god for iPhones and Walgreens). During college summers and breaks, I manned the desk at the Hamilton County Courthouse, retrieving daily case files for the magistrates and judges—it was divorce court, so very few were in a good mood (but the judges couldn’t have been nicer to me). Every writer must find his / her own style to be productive. Sharing the process inspires other writers and satisfies reader curiosity. Brian offers a look into his creative style and gives some good advice. “I like to write in chunks as opposed to writing every day. I’m constantly brainstorming and writing down my ideas on notepads and napkins and scrap paper and anything I can find when an idea hits. Then I collect them into Google Drive docs. When I feel inspired and motivated, I sit down and work through the ideas, sorting and writing scenes and essays and whatever I’m ready to write. Creatives, whatever their medium, see inspiration everywhere, and often within. We must keep our wells filled in order to continue creating. On this, Brian not only tells what inspires him, but in his words is a subtle reminder to be supportive of other creatives, which also helps fill our wells. “Reading amazing books by others always inspires me. The creativeness and thoughtfulness that goes into these epic tomes that entertain me or teach me something (or both) make me want to do the same for others. To know that I could write something that makes someone laugh or think, or makes them smile just a little bit, makes me feel good, really motivates me. Also, my family feeds my writing life. Since I write a lot of creative nonfiction about fatherhood, they feed my stories with life lessons and humor that I couldn’t even make up. It works out perfectly for me, as I’m built really for two things: to be a writer and be a dad. Knowing I can merge both to do something that entertains others is just icing on the cake. I don’t keep a journal, just a running Google Doc of ideas, jokes and lines that I save and, if I’m lucky, turn into something of value one day. 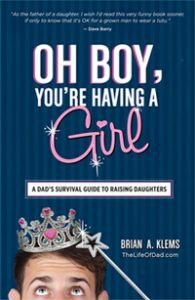 When Brian became a father, his life changed dramatically, and he desired to share his experience in his humorous book “Oh Boy, You’re Having a Girl: A Dad’s Survival Guide to Raising Daughters” and parenting blog Parenting Blog. “Like I said, I’m cut out to be a dad—I love everything about it. The hugs and cuddles. The coaching their sports. The reading on the couch before bedtime. The helping them with their school work. The bringing their lunchbox up to school when they forget it. The dirty diapers (OK, so that I could have lived without, though thankfully, those we retired years ago). My wife and I make a great team and being a dad is the best job that I have. Many writers have various interests that come out in different genres and are creative in multiple ways, resulting in blogs, vlogs, non-fiction, fiction, etc. Beyond his editing position and humorous parenting work, Brian has other projects in the works. He shares his wisdom in the truism of gratitude. “Aside from parenting essays and my book, I’m working on a Young Adult novel right now. It’s the biggest challenge facing me, as novel writing is so eye-opening. In fiction you have endless choices, and I like to debate each one to find the best scenarios I can for my characters. It’s moving slowly, as my fiction writing always does, but I’m making progress. As far as snail mail or poetry, I don’t write much of either. I wrote poems to my wife when we were still young lovebirds in college, but now I win her affection by cleaning the dishes and keeping the grass cut lower than our neighbors. He’s a funny guy who loves his kids tremendously and can find the humor in their everday actions. 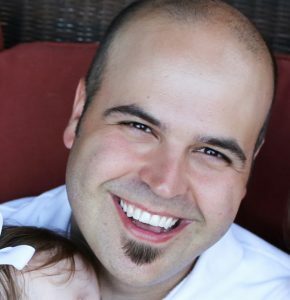 Buy his humorous parenting book “Oh Boy, You’re Having a Girl: A Dad’s Survival Guide to Raising Daughters” and read his parenting blog The Life of Dad. Find valuable information on his professional website Brian Klems and follow him on Twitter @BrianKlems. Thank you, Brian Klems, for favoring a new blogger with an industry professional interview. I appreciate your online advice, humor, and especially your support of other writers.